Successfully Added Money Counter and Counterfeit Note Detector to your Shopping Cart. Multi-cash counter and counterfeit detector for counting multiple currencies and verifying that all the money counted is genuine. 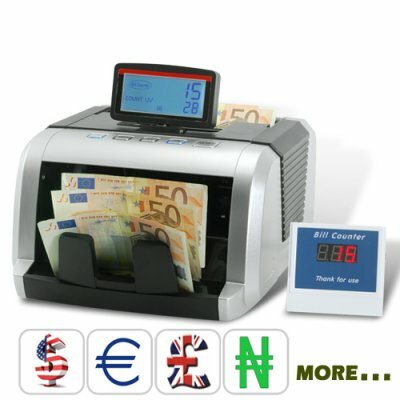 This Money Counter & Counterfeit Note Detector offers exclusive peace of mind. Provided with a top mounted numeric count display screen as well as a detachable LCD display for customers, this helps keep your counts accurate and quick. With built in UV and Thread detection, this unit prevents any fakes from being passed onto you. This Money Counter and Counterfeit Note Detector is capable of counting and detection notes of all the popular world currencies including the UK GBP, US Dollar, Euro, Hong Kong Dollars (HKD), Arab Emirate Dirham (AED), Australian Dollars, RMB and many more. Detecting fake bills just by looking at it, is not exactly the most efficient or even reliable way of knowing for sure if a bill is fake. Counterfeit notes are becoming more difficult to detect with the naked eye, that's were advanced machines like this 2-in-1 multi-currency money counter & detector comes in. This is a professional grade unit being offered exclusively to our customers at a low factory-direct wholesale price, making this new money counter and counterfeit detector a must-have-product for any small, medium or large business. Click "Add to Cart" right now and we'll express ship you a sample straight away. This Money Counter and Counterfeit Note Detector is brought to you directly from the leaders in factory direct China wholesale electronics, Chinavasion. Money counter for fast counting. Comes with thickness adjustment, very useful when counting notes of different currencies. What happens when money is jammed in the hopper? Some currencies are thicker than other, this model comes with a hopper adjustment so when you count different currencies, you can adjust the thickness of the hopper accordingly. Normaly the money counter stops rolling and you'll be able to just pull the currency note out. Can I count worn and used currency bills on this machine?